When Hannah discovers she is an abortion-survivor, she embarks on a road trip of self-discovery leading her towards her shaky begins and uncertain future. 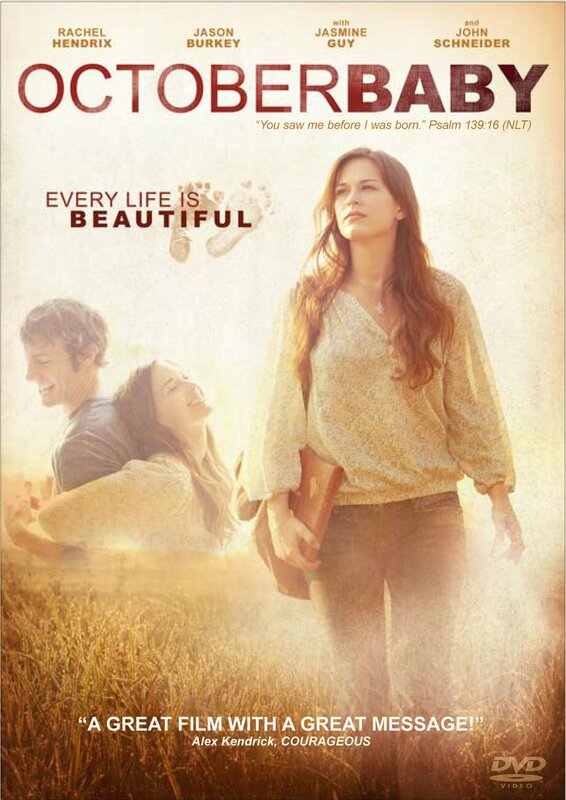 This pro-life movie is a pursuit of truth, ultimately leading her towards God's love. Looking for a sensitive film about the issue of abortion? 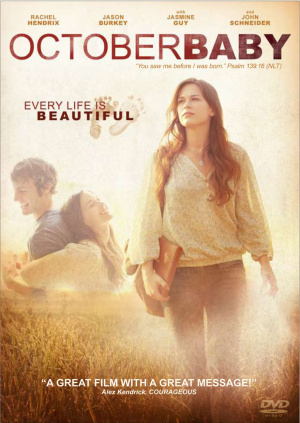 The Christian film of 2012, 'October Baby' is a love story interwoven with a compelling message about the sanctity of life and the truth that everyone is beautiful in God's eyes. Following a sudden health trauma, first-year college student Hannah discovers she is not only adopted, but that her birth-mother attempted to abort her. Hannah is one of the hundreds of abortion survivors. Filled with mixed emotions, Hannah embarks on a journey with her college friends to unravel her hidden past and find hope for her future. Her travels to self-discovery are rocky and uncertain, but ever so important to uncover the truth. From the famous verse in Psalm 139: "You saw me before I was born..." and truth that some hundreds of attempted terminations result in a live birth, the filmmakers have created a moving story that is part self-discovery, part road trip movie, part redemption story. If there is one film you and your family should watch, it's 'October Baby'. The story is captivating and the message is heart-breaking but also heart-affirming. Subtitles available on DVD: English, Spanish, French, Dutch, Swedish, Danish, Croatian, Italian, Polish and German. This DVD is Region 2, and will play on a UK DVD player. Dove Rating: "Family-Approved" - Recommended for ages 12 and over. October Baby DVD by Provident was published by Provident Integrity Europe in September 2012 and is our 7309th best seller. The ISBN for October Baby DVD is 602341005296. This film is a triumph of integrity and sensitivity for the film makers. To be able to produce a film which covers such a delicate and devastating subject, and to finish up with a work that is gentle,winsome and redemptive is no mean feat. You will learn about the life affirming power of forgiveness and the love that heals even deep emotional wounds and feelings of self hate. There is much negative noise concerning this title and many bad and lukewarm reviews from the MSM. But any movie that dares to speak the truth about abortion will be panned. Ignore these reviews. Unashamed Christian pro-life propaganda? Ask abortion survivor Gianna Jessen ,who also sings one of the songs in the movie. And do hear her testimony. A great film for small groups. This film is one of a kind and was extremly real in how the story was developing, highlighting alot of difficult area's of a female growing up and trying to find her identity which uncovers her beginning. The miracle that she is alive! How health problems can be connected to trauma experienced during our lives and the Lord faithfully will restore and bring healing if we allow Him closer! Got a question? No problem! Just click here to ask us about October Baby DVD. As the curtain rises, Hannah hesitantly steps onto the stage for her theatrical debut in college. Yet before she can utter her first lines, Hannah 'unscripted' collapses in front of the stunned audience. Bewildered, angered, and confused, Hannah turns for support to Jason, her oldest friend. Encouraged by his adventurous spirit, Hannah joins his group of friends on a Spring Break road trip, embarking on a journey to discover her hidden past - and find hope for her unknown future. "In the Eden Spotlight today is the emotion-filled film – October Baby." "When young Hannah discovers she was adopted she also discovers something even more awful about her past – she survived an abortion. Dealing with this realisation becomes an emotional journey into her past, as she and her friends drive a VW Camper Van in search of her birth mother"
"Amidst the adventure of self-discovery, Hannah learns that life is can become so much more than you first expect. This film is both heart-breaking and heart-affirming, with a strong pro-life message that every life is beautiful." "POWERFUL! OUTSTANDING! I was not prepared for the impact this movie would have on me. October Baby is THE must-watch movie for all families in 2012." "OCTOBER BABY not only has a beautiful message, it is beautifully made. It is a must-see masterpiece film for life, so critically needed at this time in history." "Powerful, emotionally charged and worthy of every accolade the film industry has to offer.OCTOBER BABY will change you ... just open your heart." "OCTOBER BABY is a heart-warming story of redemption that brings to the big screen how a seemingly small decision can powerfully affect many lives and relationships. See it—you'll be inspired!" "The sanctity of life has always been a calling for God's people. We are excited to see the impact OCTOBER BABY will have on our society as people are reminded in a powerful way that 'every life is beautiful.'" "OCTOBER BABY is a powerful witness to the beauty and significance of every life!" "I applaud the creators of OCTOBER BABY for their significant portrayal of the value of life—even in desperate circumstances. I encourage everyone to see this inspirational movie!" "OCTOBER BABY will change and save lives. You don't want to miss it!" "Hannah's journey to find answers and embrace her identity leads her to hope, acceptance, and love—and leaves us celebrating life." "OCTOBER BABY broke my heart, encouraged my soul and made evident in a fresh way the vital role and responsibility men have in preventing abortion, holding families together and raising children who know and experience love." "OCTOBER BABY is compelling and inspirational—it has the potential to change hearts and minds. … It will help people better understand the gift of life and the power of forgiveness." "Incredibly compelling, with a great ending!" "OCTOBER BABY is a riveting story about life and the value of every individual created at conception in the image of God." "Finally! A faith-based film that is accessible for believers AND unbelievers that is compelling, artistic, and extremely well done! I loved how this movie was very much pro life, yet it didn't villainize any particular party. Everyone was broken and everyone needed a second chance. So true to life!" "OCTOBER BABY is a thought-provoking film that shows how a tragic decision can reverberate for decades—affecting the lives and futures of many individuals. It is a story that needs to be told and this film tells it in a wonderful way. Everyone should see it." "The message of forgiveness and redemption will inspire everyone who sees it." "October Baby touches home and leaves imprints on your heart!" This film seeks to examine the issue of abortion and its implications in a sensitive way. While it is clearly ‘pro-life’ it is also non-judgemental, advocating forgiveness and grace as solutions to those emotionally hurt by abortion. At 107 minutes in length, the story is far from superficial - time is taken to give the plot authenticity and depth. Although ‘October Baby’ was made in America, it is accessible for British and European viewers not only because the plot has transcendent relevance. Subtitles are available in English, Spanish, French, Dutch, Swedish, Danish, Croatian, Italian, Polish and German. The DVD is rated 12 because the theme is fairly mature and parts of the film are quite emotionally charged. Eden.co.uk provides ‘October Baby’ in DVD region 2, which is suitable for all British DVD players, computers and games consoles. Phenomenal success experienced by this film doesn’t just line the purses of those who made it - October Baby Ministries seek to assist women and families experiencing a tough pregnancy situation by offering advice and giving contact information for helpful and relevant organisations. Seeing the film as an opportunity to ‘give back’, ten percent of the profits are going to the 'Every Life is Beautiful' Fund, which distributes money to frontline organisations helping women facing crisis pregnancies. The October Baby DVD, and the paperback book of the film, releases in the UK on 11 September 2012. Jon Erwin says, “people just really identified with the film emotionally... I hope there can be a surge of conversation.” – Les Ellison.